There are so many different ways to wear ankle boots. That’s because there are varying ways to style them and many different styles to choose from. It’s important to wear the right style of boot for the right occasion, whether you need a smart or casual look. It’s also vital to feel comfortable and secure in your footwear. As a rule of thumb, the higher the heel and the thinner the heel, the less stability it provides. The thicker the heel, and the shorter, the more stability it provides. There are many different styles of ankle boots, and finding the perfect pair for you could take a long while. Although, due to there being so many different types, you’re bound to find a style perfect for you. Kitten heels are usually less than two inches high and the heel itself tends to be rather thin. Although the heel is thin, as it’s also low so these boots provide a good level of stability, and are easy to walk in. They add some height, making them rather more elegant than a flat boot. Wedge heels tend to be a little taller than kitten heels, yet, are as easy to walk in. This is due to the fact there isn’t a gap between the front part of the shoes and the heel, the wedge lets you have a little more stability with the ground. When learning how to walk in heels, wedges are often worn first. Chunky or block heeled boots are also a comfortable choice, they aren’t as stable as wedges, but they are much more stable than stilettos. They give your heel a little more surface area, so the pressure isn’t too harsh on the heel of your foot. When fitted correctly, open or peep toe shoes can be super stylish, allowing your manicured toes to add a hint of glamour to your outfit. They allow you to wear killer heels with added warmth and security, making them more wearable in the cooler seasons than shoes. These are by far the most comfortable, and the most relaxed. Flat ankle boots can pretty much be paired with whatever outfit you have on, and are perfect for the cooler, rainy days. Lace up ankle boots can be any style, from flat boots to peep toe. They secure the boot to your feet and ankles with laces that can adjust the fit by tightening or loosening. Although, you have to be careful with how tight the laces are, especially around the ankle area. As the day goes on and your feet swell, tight lacing can cause numbness and pain in the ankle and foot. 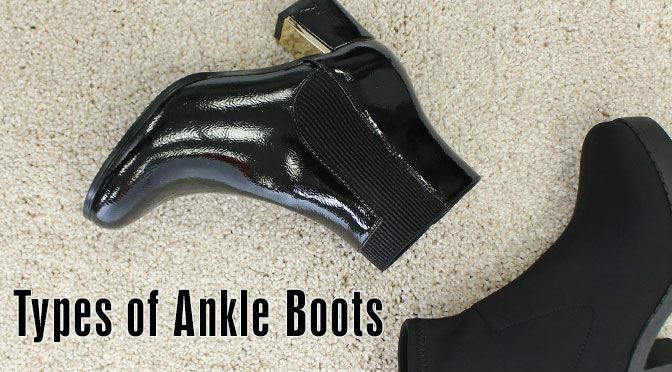 Buckle or strap boots can usually provide more support to your ankle over just slip on boots. Make sure to check that the strap can be adjusted to your size and isn’t too big, or too small. Too big could mean little support which can hurt your ankles. Too small could mean numbness in the ankles and feet, so be sure to buy the best fit for your feet. Tassel boots don’t usually add anything to the fit of the boot, yet paired with the right outfit they can add a stylish detail that completes your look. Boots can be a stylish choice for men too. Although men’s styles are flat, there are still a distinct number of varied styles available. Lace up boots tend to be rather popular with men and also tend to be the most common, along with Chelsea boots. Lace up’s again, provide a lot of support, especially to the ankle and are usually rather comfortable to wear. Pull on boots are efficient and easy, what a lot of people love to hear. The main pull on boots tend to Chelsea boots, or look alike Chelsea boots. They also comfortable to wear. Chelsea Boots, again are pull on boots that are stylish and smart. If you are looking for some new boots, these are the style that you will see in a majority, if not all shoe shops. They’re an iconic style that’s been fashionable for decades and are still just as on-trend today. Desert boots, otherwise known as the Chukka Boot, are lace up boots that are usually made of suede or imitation suede. These lightweight, casual boots are great for weekend and casual workwear. Walking boots, or hiking boots are just a simple lace up boot with more built in comfort. They are designed to provide support to the ankles and cushioning around the foot. They also protect the feet from elements, like rain and uneven grounds. As there are so many different types of boot, it’s hard to know what to wear when. Take a look at our guide to wearing ankle boots for different occasions. The best booties for women to wear to work, tend be slip on block or chunky heels, or lace up boots. It’s best to keep a smart look by opting for a significant heel, but nothing exceptionally high. You can wear heeled ankle boots with skirts, trousers and dresses. If you are wearing trousers, try to go for cuffed trousers. If you’re going for a skirt use this as a guide: the shorter the skirt the higher the ankle boots. You don’t want to wear a mini skirt with low cut ankle boots, try pairing lace up, calf, knee high or over the knee boots with that outfit. As for men, Chelsea boots, or desert boots are the best workwear options. Chelsea boots look the smartest with suit trousers, while desert boots can dress jeans up a little if your work place isn’t too casual. Chelsea boots are a popular choice for little boys as they’re easy to put on and off. They’re usually quite forgiving but supportive, smart and durable. For little girls, pull on or lace up boots are best as they will support the ankle and will be easy to slip on and off. When going for a job interview, you want the focus to be on your skills, not on the curve of your leg, or hemline. So, the higher the heels, the riskier it gets. Keep your look smart and simple, wearing understated boots with a small heel if you want a bit of lift. Black is probably best in an interview situation, as long as it tones well with your smart outfit. Ankle boots can be worn a wedding, as long as they are worn correctly. They’re a great choice for autumn or winter celebrations when you need to keep your feet warm and comfy ready to dance the night away. Ladies, if you’re wearing trousers to the wedding, ankle boots can be used to slim down your ankles a little, they also go really well with cuffed trousers. When it comes to dresses, the right boots can go well, but choose a smart style and select the colour carefully to compliment your outfit. For men, Chelsea boots will go well with a suit, as this iconic style is both smart and easy to style. Finding the right style of ankle boot for yourself can be a hefty task, so try plenty of different options on. Work out which style would fit into your wardrobe best. When styling boots, first make sure you feel comfortable in your outfit. Check you look formal enough for the occasion in question, and the colours you choose complement each other, and you should be good to go. Most of all, enjoy experimenting with ankle boots!